Will this be an ice game? Picture the scene: you want to set out on an exciting journey with zany penguins, but international law prohibits you entering the animals' habitat, even if it is in order to lead them safely through 100 frosty levels by issuing commands such as walking, jumping or waiting. You know that without you they have no chance of survival, and that you must guide them to avoid broken ice areas, falling cages, wolves and other dangerous obstacles, but Greenpeace is resolute in its opposition to your plans. What can you do? Download Arctic Escape for DSiWare on Monday, perhaps. The latest downloadable title from Polish digital juggernauts Teyon, the game is tailor-made for just such a situation as this. A cunning scientist has taken the penguins from their natural Antarctic habitat and taken them to the North Pole, and it's up to you to restore order to the penguins' world through gameplay that combines Lemmings with chuchu_rocket]ChuChu Rocket. Arctic Escape waddles to North America on Monday for 500 DSi Points. Set on a frosty adventure with Arctic Escape on Nintendo DSiWare! Teyon, a Polish video games developer and publisher, revealed today their latest puzzle game coming to the North American Nintendo DSiWare™ service. Start an exciting journey with zany penguins that will twist your mind on February 21st when Arctic Escape arrives in the service. The title will be available for just 500 Nintendo DSi Points™. 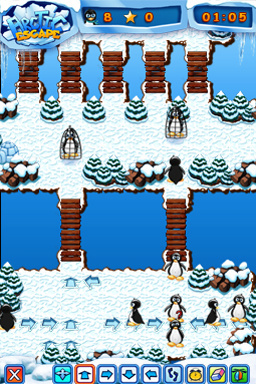 Take control of a bunch of penguins getting into all sorts of troubles all the time! They were abducted from Antarctica by a cunning scientist and now they need your help to come back home. Lead them safely through over 100 frosty levels by placing commands such as walking, jumping or waiting. Without you they have no chance of survival so guide them to avoid broken ice areas, falling cages, wolves and other dangerous obstacles. This special top-down view puzzle is easy to pick up but impossible to put down! hmm. seems good. teyon did great with robot rescue but it could probably use a little more variety to avoid repetition. I think I'll stick with DodoGo challenge. Seems like layton's car game taken to a new level. Looks like Timekeepers for the Amiga, from way back in 1995. I liked that game so I might have to check this one out. I think if this will costs only 200 NP, than I might get it. Cute!!!!! I like the idea of this and might try it, but when will it come to Europe?